Of those headlines, only one I know to be completely true: Battery life is crucial to 'the Generation Y' (and yes, I chuckled at the addition of 'the' before Generation.) However, you could easily say that battery life is crucial to EVERYONE. Absolute statements such as these pop up as if they are the gospel truth. GEN Y SHUNS SUBURBS BECAUSE THEY HATE FAMILY AND SPEND ALL THEIR TIME ON THE INTERNETS. 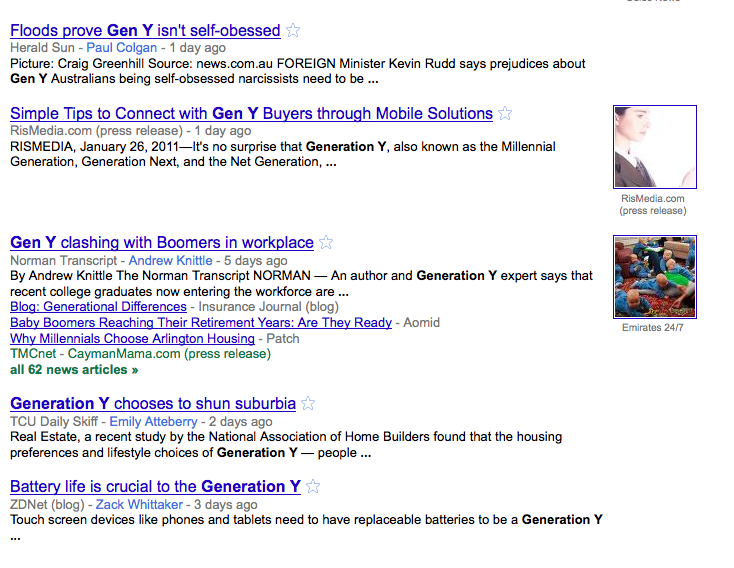 THE FLOOD SHOWS THAT GEN Y Isn't SELF OBSESSED AND AS TERRIBLE AS PREVIOUSLY THOUGHT. GEN Y HATES BABY BOOMERS AND ALL OF THE OLDS. All of these theories, hypothesis and guesses as to what we like have a 50% chance of being true. Of course, they also have a 50% chance of being false. What I'm saying is this: don't believe the hype. Yes, we're the kids skateboarding down the street, the baristas serving you coffee at Starbucks, but we're also just people. We probably like some of the same things you. And we probably hate some of the same things, too.